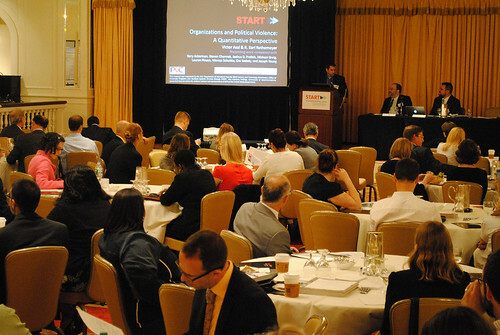 Nearly 150 homeland security practitioners joined START this month for a one-day symposium on Sept. 11, highlighting some of the consortium’s most mature and impactful research efforts. Attendees represented government offices and organizations including, the Department of Homeland Security, FEMA, DNDO, USSS, NSA, DOD, Department of Justice, FBI; as well as various international embassies. Gary LaFree, START director, and Erin Miller, Global Terrorism Database manager, discussed the Global Terrorism Database (GTD), the world’s largest unclassified terrorist incident database. They spoke on best uses for its data, the innovations made to the GTD collection process and recent strategic partnerships. They were joined by Caroline Crouch Henne from Palantir, who spoke about how her team has built a data visualization platform that makes the GTD more readily accessible to the law enforcement community and public. An analyst from the DHS Office of Intelligence and Analysis discussed the importance of utilizing open-source data to complement classified data. Victor Asal and Karl Rethemeyer, both START researchers from the University at Albany, SUNY, then discussed a quantitative perspective on organizations and political violence. They explained how the Big, Allied and Dangerous (BAAD) and Minorities at Risk Organizational Behavior (MAROB) datasets help researchers and practitioners understand what makes organizations turn to violence in the first place and why some violent organizations are more lethal or more interested in weapons of mass destruction than others. 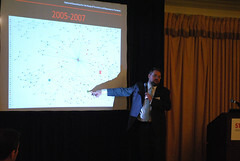 Gary Ackerman, Ruth Bluestone and Brandon Behlendorf, all START researchers at the University of Maryland, described the evolution and practical application of the prototype Transnational Illicit Trafficking Tool (TransIT). The TransIT tool is being developed by marrying the latest geospatial analysis techniques with data on adversary behavior, in order to identify trafficking “chokepoints” where scarce enforcement and detection resources can be focused. The initial application involved modeling the illicit movement of radiological and nuclear materials by transnational criminal organizations working on behalf of terrorists into the United States through Central America and the Caribbean Basin. 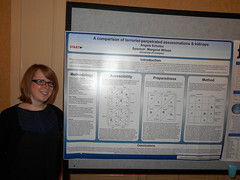 START Terrorism Research Awardees and Undergraduate Research fellows also presented posters on their work. About 50 alumni of START internship and minor programs also attended a networking session after the symposium. The symposium was funded through START by the Department of Homeland Security Science and Technology Directorate Office of University Programs. Lecture: The Changing Nature of Radicalization in Pakistan, Shazadi Beg START HQ, 8400 Baltimore Avenue, College Park. RSVPs to infostart@start.umd.edu are appreciated but not required. Research Round Table: Leadership, Radicalization, and Ideological Violence, Drs. Gina Ligon and Peter Simi START HQ, 8400 Baltimore Avenue, College Park. RSVPs to infostart@start.umd.edu are appreciated but not required. Book Talk: “Hezbollah: The Global Footprint of Lebanon's Party of God," Dr. Matthew Levitt START HQ, 8400 Baltimore Avenue, College Park. RSVPs to infostart@start.umd.edu are appreciated but not required.